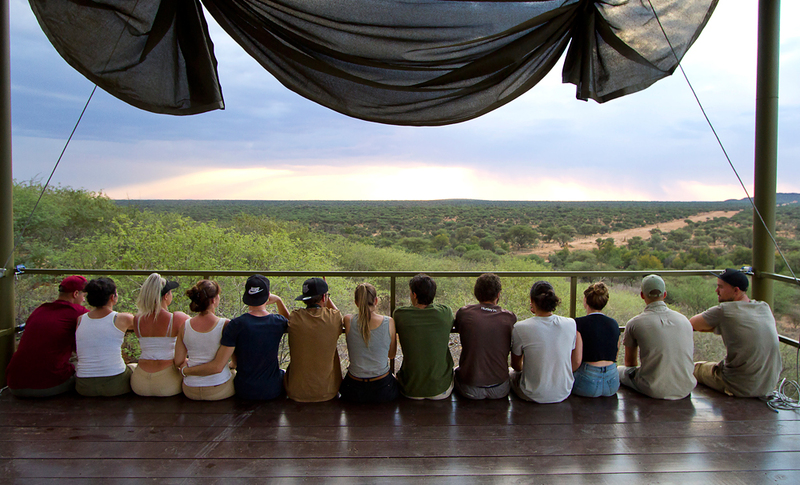 The ISAP Volunteer Training Programme provides an amazing opportunity to experience the African bush and wildlife from a hence unknown angle; not only will you share bush accommodation with the wild animals, but you will be taught how to become part of their environment and to protect them from the potential threat of poachers. ISAP offers an Anti Poaching / Wildlife Adventure Experience which consists of two phases, with the first phase of two weeks being more basic bush skills / Anti Poaching training, offering a tremendous bush experience mixed with wildlife observation and encounters. For those who would want more, a second phase of 10 days may be signed up for, following phase One. Your support of the ISAP Volunteer program directly supports ISAP's anti poaching activities and projects in Namibia. During the initial two-week programme you will stay in the ISAP Base Camp where animals like kudu, oryx, zebra, giraffe, wildebeest, impala, waterbuck, roan antelope, nyala, baboon, warthog and many more regularly visit to drink at the waterhole , or simply to check out the new faces in camp. Once settled into tented accommodation, the training programme will commence and you will be coached by highly trained and experienced instructors on all the intricacies of safety, wildlife, bush medicine, poaching, survival, observation, communication etc. Some of the training will consist of theory, but most time will be spent on practical real life instruction out in the bush and amongst the wildlife. The second phase of 10 Days (Deployment), which follows immediately upon completion of the first phase, will take place within a different wildlife are a. This phase will include actual deployment with the Anti Poaching Units (APU's), as well as assisting the sanctuary staff with environmental duties or projects, monitoring of endangered species and providing logistical support to the APU's. Duties during the Deployment phase will be based on the individuals capabilites and preferences i.e. not all voluneers may want to spend time in the bush with APU's. This offers a great opportunity to give back to the environment by contributing to the protection of wildlife in Africa, where so many species are already under threat of diminishing numbers and extinction. Arrive at Hosea International Airport and transfer to ISAP Base Camp in the bush. Accommodation will be in twin sharing tents, with flush toilets and hot showers available. Intruduction to bush life will be given. Debriefing, clean up, pack up and transfer back to Hosea Kutako International for the flight home. 1. Vehicle transfers from Hosea Kutako International airport to Base Camp and training venues and back. 2. Fully qualified and highly experienced field instructors. 3. A qualified paramedic with comprehensive trauma kit. 4. All terrain vehicles & trailers for bush work. 5. Tented accommodation with mattresses, chairs, tables, cutlery and crockery throughout. Participants provide their own sleeping gear, personal effects and day packs. 6. Three meals per day whilst in Base Camp. Food provided for bush excursions. 7. VHF hand held radios for all control staff and support vehicles. 8. Satellite telephone for emergencies. 9. Comprehensive Emergency Response Plan. NB: Euro rate may change with fluctuations in currency exchange rates - final amount payable will be confirmed on successful application! Cost of flights and medical / travel insurance are not included! Transfer to deployment area. Accommodation will be provided in twin sharing rooms, with flush toilets and hot showers available. Intruduction on deployment will be given. Debriefing, clean up, pack up and transfer back to Hosea Kutako International for the flight back home. ONE CAN EXTEND ONE'S STAY AT YOUR DISCRETION - PLEASE INDICATE EXTENDED STAYS ON APPLICATION OR DURING PROGRAM & WILL BE DEALT ON A PERSONAL TAILORED PACKAGE. ISAP bush clothing will be available to purchase, this will be optional for the 1st Phase, however compulsory for those enlisting for 2nd Phase. Uniformity will be needed when deploying into areas as you will be official ISAP representatives.